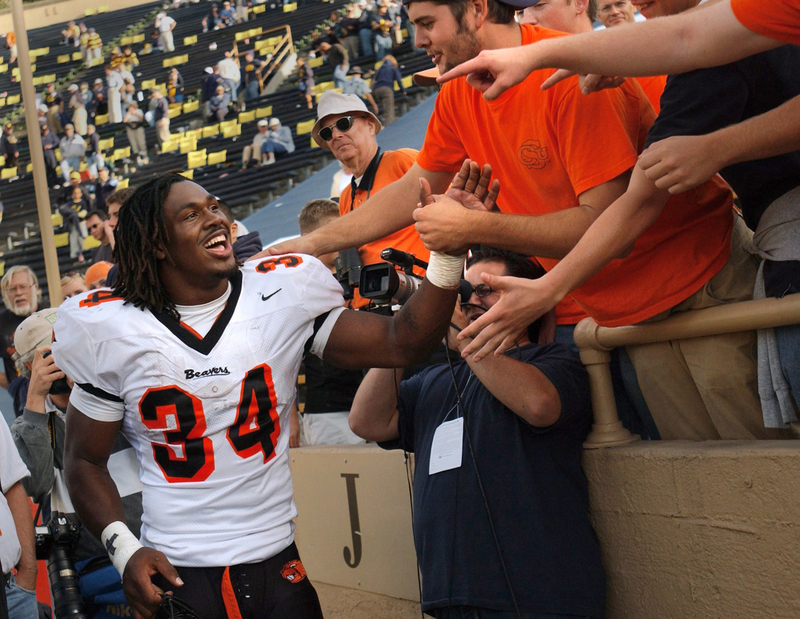 There’s no denying the impact that three years at Oregon State University had on Steven Jackson, and next month he will be recognized for the impact that those three years had on sports in the state of Oregon. On September 25th, Steven will be inducted into the Oregon Sports Hall of Fame, celebrating his athletic endeavors during his time at Oregon State and where they stand in the rich history of sports in Oregon. He will join the Hall of Fame’s list of more than 350 inductees. SJ left an indelible mark on Oregon State Football as a running back, amassing 3,625 rushing yards and 39 rushing touchdowns, which at the time both stood second in school history, behind only his predecessor Ken Simonton, a 2013 inductee into the OSHOF. Steven’s 1,690 rushing yards during his sophomore year remain the high water mark for single-season rushing yards in Oregon State history. He followed that season up with a junior year posting 22 total touchdowns and 132 points, most in the NCAA. But more than his individual marks, Steven’s impact showed in his team’s performance. Over the course of those three years in Corvallis, SJ helped guide the Beavers to two bowl games, and a victory in the Las Vegas Bowl before he departed for the NFL. That success built upon and carried on a new legacy of Oregon State Football, which began just before he arrived at Oregon State, when the Beavers won the 2000 Fiesta Bowl, their first bowl victory in nearly 30 years. From 1999-2014, Oregon State went to 11 bowl games and won seven of them. It is for that reason that Steven’s time at Oregon State represents the start of a golden era of Beavers football that will be hard to duplicate as the program moves forward. As such, Steven was on the committee just a few years ago to select a new athletic director for Oregon State, which ended with Scott Barnes being named athletic director proving his lasting value to the program as an ambassador. Steven headlines a 2018 Hall of Fame class that also includes former MLB umpire Jim Joyce, multi-sport athlete Dan Jones, the East Bank Saloon senior basketball teams, and Tim and Gert Boyle of Columbia Sportswear, for the company’s special contribution to sports in the state of Oregon. Additionally, the OSHOF will honor the next wave of athletes from Oregon, awarding six scholar-athletes with college scholarships, made by possible by the MacTarnahan Family Trust. Cole Little (Culver), Alden Huber (Dayton), Nathan Seggerman (Pine Eagle), Carrie Lillis (Philomath), Jenavieve Lustyik (Bend) and Elizabeth Powell (Oakland) will all receive scholarships to continue their education at Oregon colleges and universities. The 2018 Oregon Sports Hall of Fame induction ceremony is scheduled for Sept. 25 at Portland’s Multnomah Athletic Club. The 2018 induction ceremony will begin with a reception at 5:30 p.m. followed by dinner at 7. Tickets are $125 per person; tables of 10 are $1200. To purchase a ticket, call the Hall of Fame at 503-227-7466, email info@oregonsportshall.org or visit www.oregonsportshall.org for additional information.